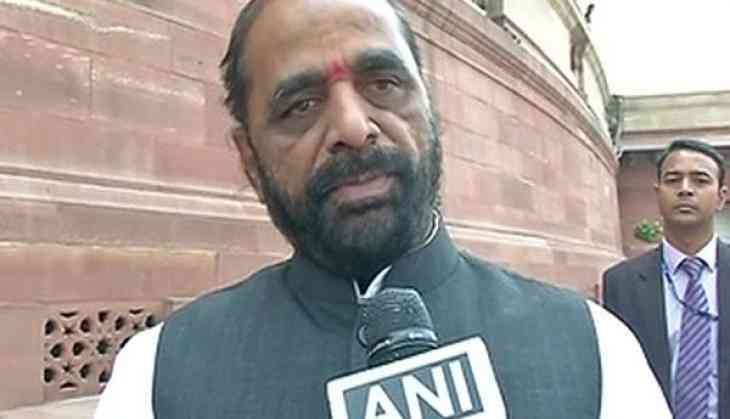 Minister of State for Home Hansraj Gangaram Ahir says Congress president Rahul Gandhi "insulted the country" when he compared Karnataka political turmoil with Pakistan. "I believe criticising BJP or ruling party is the right of opposition. But Congress president has spoken against the country. He has insulted the country. I condemn this gesture. Such statements should not have been given," Ahir told ANI. Besides Ahir, senior Bharatiya Janata Party (BJP) leader Subramanian Swamy also slammed Rahul and said that comparing the situation with the "third rate country" Pakistan is an insult. "Karnataka is in our hand, that's why they (Congress) are scared. They have lost their balance. "He (Rahul Gandhi) can attack Modi, BJP, and anyone he likes, but he can't attack the country," Swamy told ANI. "Country is something very precious. Comparing it with third rate country like Pakistan is an insult. Does he have any sense? I think he should go and have mental checkup," he added. Earlier, while addressing Jan Swaraj Sammelan in Raipur on Thursday, Rahul said the way the Rashtriya Swayamsevak Sangh (RSS) is capturing the independent institutions of the country, that happens only in Pakistan. "One by one, the RSS has captured the independent institutions of the country. Such things happen in Pakistan or in a dictatorship," Rahul said. "In Karnataka on one side there are MLAs standing and on the other side the Governor. JDS has said its MLAs have been offered Rs 100 crore each," he added.